There are 2 basic elements to pool chemistry: water balance and sanitation. Your pool water is delicate, and in order to reach perfect pool harmony, it must be balanced. Balancing your pool means keeping the pH of the water between 7.4 and 7.6, which is slightly above neutral on the pH scale. There are 3 main ingredients to keeping this balanced: pH, alkalinity and calcium hardness. pH alone is unstable. Rainwater, swimmers, and just about anything that enters the water can affect the pH level. When pH is low, it means your water is acidic, and when it’s high, you water is basic. To give you an idea of how pH works, our tears are pH neutral. If they had a low pH, it would burn when we cried. And if the pH was high, it would dry out our eyes. 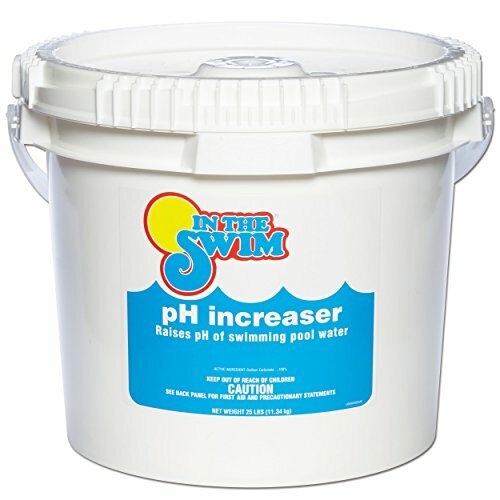 Always keep a good supply of pH Increaser on hand because this reading can change frequently. It’s best to keep a large supply of pH Increaser on hand because your pH can fluctuate a lot during the season. The opposite of pH increaser is pH decreaser. Chances are you’ll use less of this chemicals but it’s still a good idea to keep on hand to help remove stains and clear the water. Alkalinity is a pH buffer, meaning it helps to keep the pH from drastically moving up and down the pH scale by absorbing major changes to the waters before affecting the pH. It’s also a good idea to keep a hefty supply of alkalinity increaser on hand since this reading can fluctuate. Proper Calcium Hardness Level: 200 to 275 ppm (parts per million) for plaster pools. While calcium hardness is not really part of water balance, it’s still important to talk about. Without calcium, your water will become hungry for it and seek to fulfill it’s appetite by feasting on your pool’s plaster, and anywhere else it can get it. Adding calcium hardness to your water will help protect your pool walls and equipment in the long run. However, too much calcium can cause scaling and other issues. NOTE: Calcium hardness should only be added once in the beginning of the season if needed. Keep an eye on it throughout the year to make sure it stays within range. If the calcium in your water is high, you will have to dilute the water by draining it a tad and refill with fresh water. It’s important to keep your eye on your pH and alkalinity levels – at least daily until you’ve gained a sense on how your pool works – by using a home test kit or test strips. You’ll notice I didn’t mention alkalinity decreaser. Most major pool chemical companies do not produce it. If your pH and alkalinity are low, alkalinity increaser will raise both. You may need to add a little pH increaser if the pH doesn’t reach 7.4 – like fine tuning an instrument. If your pH and alkalinity are both high, pH decreaser will lower both. If you have high alkalinity and low pH, you’ll need to lower the alkalinity first by adding pH decreaser. Yes, this will also lower pH levels even further. Once the alkalinity is where it needs to be, work on raising the pH with pH increaser. This situation can be tricky to correct, and it may take several tries to get both levels back to normal, so make adjustments gradually to avoid throwing things even further out of whack. If your pool is properly balanced at all times, it will make your pool’s sanitizer work more effectively. Chlorine is an extremely effective bacteria and algae killer, and cost effective. Chlorine tablets are the most popular form. They come in 3” and 1” tablets and can be added to a floating chlorine dispenser, a chlorinator, or the skimmer basket(s) in your pool. Bromine is chlorine’s halogen cousin and it more commonly used in hot tubs and indoor pools because it doesn’t give off that “chlorine” smell. Bromine works a little differently than chlorine and it’s not as effective when dealing with certain types of algae. It’s not recommended for outdoor pools in direct sunlight. Sunlight eats up bromine very fast because it’s unstabilized. This is a chlorine alternative. It’s an effective sanitizer for swimming pools and even makes the water feel smoother. Sanitizers like Baquacil and SoftSwim are part of a total chemical package and should not be mixed with standard pool chemicals. You must stick the pool chemicals offered by these brands, including shock and algaecide. These chemical packages are more expensive than traditional chlorine-compatible chemicals, and they come in liquid form. Silver and copper minerals are introduced to the water by an mineral system that resembles a chlorinator. These minerals work to sanitize the water, but they are much slower than chlorine. A mineral system is NOT a complete chlorine alternative as chlorine is still required – but only a small amount as backup. Shocking your pool is another term for adding a ton of chlorine to your pool. When a chlorine particle attacks and kills bacteria, or other organic material in your water, it is read as combined chlorine. This just floats around in your water until it can be oxidized and broken apart. In order to oxidize, you must “shock” the water by adding enough chlorine – or non-chlorine shock including Potassium Monopersulfate – to reach breakpoint oxidation. I personally recommend using calcium hypochlorite pool shock at least once a week. To reach breakpoint oxidation, the chlorine reading must be 10 ppm over your combined chlorine reading. Your chlorine has two readings: free chlorine (FC) and combined chlorine (CC). Free chlorine refers to the chlorine that is free and available to kill. Combined chlorine is chlorine that has done it’s job. NOTE: Pool shock products are made with unstabilized chlorine or no chlorine at all. They will go in, do their job, and get eaten up by the sun’s UV rays very fast. That’s why it’s important to shock your pool at night or dusk, and let it work for 8 hours (with the pool running) throughout the night. You should shock or oxidize your pool at least once a week. If you only used pH, alkalinity, calcium, and a sanitizer, you could keep a clean and healthy pool all year long. However, there are a few more products you should be familiar with in case you need or decide to use them. Most chlorine products you add to the water will be stabilized chlorine. However, if you start with fresh water, you might want to add some cyanuric acid (aka water stabilizer) as a stabilizer base so that the chlorine doesn’t get burned off by the sun’s UV rays so quickly. This chemical will protect your chlorine from the sun. Algaecide is a algae preventative. There are certain algaecides on the market that claim to kill algae, but the best killer is chlorine. Use algaecide as a backup. 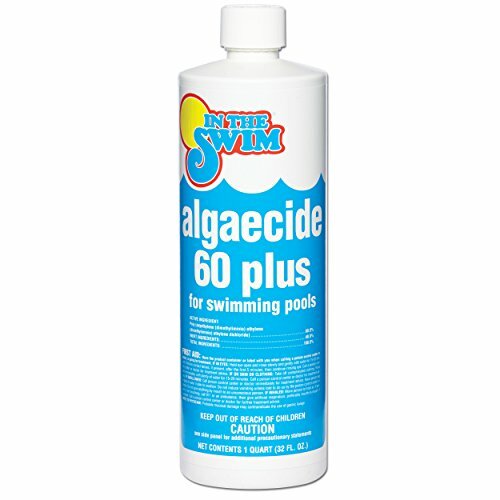 If your chlorine levels dip down, and you don’t catch it in time, the algaecide will keep the algae at bay until you can get the chlorine back up. A water clarifier helps by bringing all those tiny particles that are making your water cloudy and combining them into bigger particles that your filter will have a better chance of filtering out. Floc or Flocculant, grabs those tiny particles, brings them together, and sinks them to the bottom. With pool floc, you will have to manually get those particles out of your water by vacuuming to waste. If you have metals in your water, like copper and iron, you can use a metal remover or stain and scale remover to keep those metals in solution so that your filter can filter them out. If metals come out of solution that can attach themselves to the walls and other parts of your pool and produce unsightly stains. Make sure to practice good pool circulation and filtering, and keep your pool cleaned by vacuuming and skimming frequently. I added The Anatomy of a Swimming Pool because you should know what you’re working with before you get started.